While the nation is still fathoming over what this budget meant for them, e-commerce players can safely assume that this budget was more a friend than a foe. That’s because our PM himself is quite a tech savvy person and is waking the nation up, to tell them to enjoy the luxuries of the 21st century. In a country where cash was once king, vendors and kirana stores are now singing ‘paytmkaro’. But that’s hardly the case with the remote areas of our country. 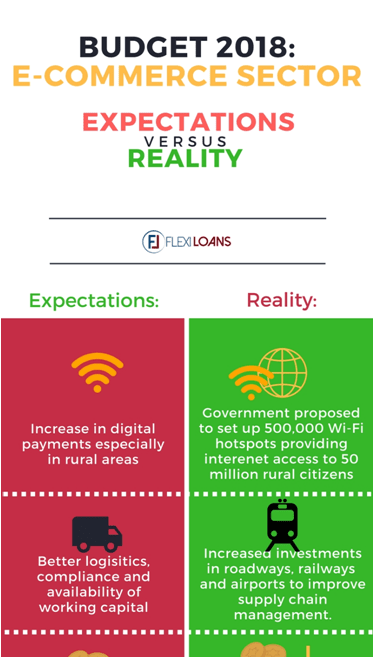 One of the best things to happen for the e-commerce sellers this budget is internet access to rural areas. The government has proposed to set up five lakh WiFi hotspots, which are expected to provide broadband internet access to five crore people in the rural parts of the country. This will be a great BOOST to e-commerce sellers, who are already leaving their mark in the rural parts of India. YourStory reported that shoppers in Tier II accounted for nearly 41 percent of the overall online shoppers in 2017. This will only grow further with internet access in these parts. One of the biggest problems faced by e-commerce players is logistics. It contributes 2% to 10% of the cost to e-commerce sellers and they are in desperate need of faster and cheaper logistics to speed up their growth. In answer to this misery, the budget 2018 has revealed some major plans for improving roadways, railways, and airways. The FM describing infrastructure as “the growth-driver of the economy has proposed significant investments in roadways (9,000kms new highways), railways (3,900km track renewal in FY19) and airports that will help any organization in supply chain management. This will also boost demand for the e-commerce industry and make so much more seamless and efficient from a logistics point. While the government’s view on cryptocurrency is still cryptic their view on blockchain- the technology that powers most cryptocurrencies is pretty clear. They want it and they believe it will be great for India. “The government will explore the use of blockchain technology proactively for ushering in a digital economy,” Jaitley said in his Budget speech. Apart from blockchain, the government wants to ramp up investments in research, training, and skilling in robotics, AI, digital manufacturing, big data analysis, quantum communication and IoT. All this will be a great push not only to the economy but also e-commerce that will be a benefit in terms of improved supply chain management, better efficiency, smoother logistics and a customer-centric approach. The government’s undying support towards has become pretty clear after demonetization. Needless to say in this Budget the government strengthened its stance on digital payments. In order to control cash economy, FM said that the cash payments exceeding Rs 10000 by trusts and institutions will not be allowed and will be subject to cash. But on the flip side, there has been a hike in the customs duty on certain segments such as footwear, cosmetics, watches, toys and more, which might be slightly bad for e-commerce players. Not to forget the hike in import duty from 15% to 20% on phones and electronics is also a dampener for e-commerce sellers. But all in all experts mood on a budget for e-commerce players is a positive one. This one gets a thumbs up from our side too. What are your views on it, comment below and share them with us! Don’t forget to like and share this post with all your e-commerce enthusiasts and tell them what you think today!